Listen up, Wildcats. Betches love to complain about winter in Evanston. It's soooo cold. Rush is soooo boring. I don't have a date for Valentine's Day. Nobody will ever love me. I'm going to die alone surrounded by my cats and McKinsey and Company employee of the month awards. The passage near Kellogg is like totally a wind tunnel. I should have gone to Madison, it's totally not this cold up there. My Wings Over order is taking sooooo long to get here. Where is my Honey BBQ? Where is the Frosbite Express??!??!? You don't have to go to parties anymore. "Yeah, like, if you don't go Greek, it's so much harder to party in the winter because, like, everyone is with their new sorority and frat friends." Oh, snap. You mean I don't have to skip hot cookie bar so I can fit into my tightest crop top and wobble to the frat quad in heels on ice? I don't have to stand in a packed basement and drink warm Natty Ice while listening to my peers yell "What's your major? LOC? What's that?" across the room? You mean I have to sit in my room surrounded by my best friends while we eat deep-dish pizza and drink cold beer that comes in a glass bottle and watch old episodes of Arrested Development? Tragedy. That's the magic of winter quarter. 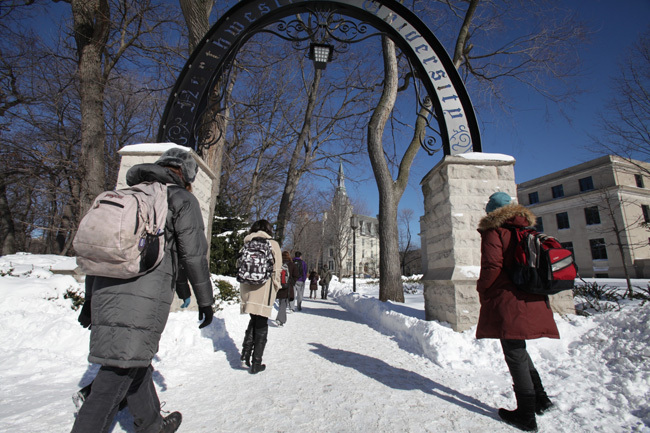 When Evanston turns into the a sparkling, white tundra, Northwestern students make like hedgehogs and go into hibernation mode (Yes, hedgehogs hibernate. I did my research. After all, this is Sherman Ave, the most truthful and accurate NU student publication on this side of the Mississippi). While some people believe our annual withdrawal from social interaction is a something to be admonished, I believe it is something to be celebrated. Who would want to spend a Friday night playing Irish Poker, watching High Fidelity, eating fried chicken, snuggling, and drinking margaritas? ME. I WOULD. Get on board, people. During Winter Quarter, always ask yourself "What would Jennifer Lawrence do at a time like this?" She would crack open a cold one and settle in for a 10 Things I Hate About You drinking game. That's what she would do. Valentine's Day. This is one of the biggies that people whine about. "But, Valentine's Day is only for people who are in a relationship!" False. On February 14, 2014, we all know where we'll be. Whether you're single, taken, engaged, widowed because your husband died in a tragic vending machine accident, whatever, we all have a date with Rep. Francis J. Underwood this Valentine's Day. Holler. At. Me. Dance Marathon. Love it or hate it (and you should love it), DM has an inevitable presence during Winter Quarter. Whether you're the non-dancer with the roommate who keeps asking you to buy cookies in exchange for a donation or the dancer who is struggling not to punch someone from DR in the face between blocks 6 and 7, DM really brings out the best in everyone on campus. Dancers will get to feel the camaraderie of doing the Harlem Shake with 800 other people who don't actually know how to do the Harlem Shake all while earning the feeling of superiority over their non-dancing friends. Wow. So community. Much dancing. The non-dancers get the real prize, though. For 30 beautiful hours, the campus is yours. Your roommates are gone. There's no line at the wrap station in Allison. That extraordinarily attractive guy from your International Relations discussion is sitting five feet from you at Nevin's and no one else is there. Use this time. You've worked hard for it. The ever-lingering possibility of a snow day. For many of us (OK, like a fourth of us), the day February 2, 2011 will live in infamy as the Snowpocalypse that tore across Chicago, forcing the cancellations of classes and, more importantly, midterms. That glorious midnight email sent students from Elder down to Willard stumbling into the hallways, open containers of Skol in hand. The next morning we awoke and nursed our hangovers in a wonderland of pure joy and fresh powder. There were no cars to dodge on Sheridan Road. No passive aggressive, smart-aleck TAs to deal with in Gender Studies discussion. CAs were powerless to stop the shitshow of fun and merriment that spread through campus. It was, by all accounts, a truly magical day. Ever since that day we've been chasing that feeling. And with each Winter Quarter snowfall, hope springs anew. So there you have it, Northwestern. Now take that Hanukkah money from Grandma and go buy yourself a cozy sweater and a six-pack of Bud Light because the greatest quarter of your life begins January 6th, 2014. You're gonna crush it.